You’ve decided to take the plunge and get a shed for your backyard – but where to begin when it comes to brand or style? This article introduces one of the leading brands in the market – Arrow Sheds and the benefits that you can expect with one of their metal storage sheds. Unlike wooden garden sheds, metal storage sheds do not warp, crack or split over time and it will remain impervious to rot, decay and insect infestation. Arrow Sheds construct all of their storage sheds in electro-galvanized steel to protect against rust and reinforce the design with steel bracing. One of the biggest draws of purchasing metal storage sheds over other options is that they can be some of the very cheapest models on the market place in terms of storage space per dollar. Arrow create two different types of shed to choose from: one standard design constructed of galvanized steel panels and a baked on enamel finish and a premium option of vinyl coated galvanized steel. 3) Roof Style – Lean-to, Apex or Barn? Just like traditional style wooden sheds you are able to purchase a metal shed with a lean to roof. The lean-to’s slope in only one direction where as gabled roofs have a peak style roof like a traditional house style. Barn style sheds are modeled on traditional Dutch barn that offer extra height in the middle. Bear in mind that not all metal sheds rooftops are designed to withstand heavy snow loads. Arrow supply, as an additional extra, a roof strengthening kit for most of their shed models which can be found at storageshedsdirect.com. One of the benefits of metal garden shed kits is that they all come with some form of locking mechanism that can help keep your items secure. These range from a single padlock to a system of keyed locks depending on the model. You commonly find three different style doors used on metal sheds, the horizontal sliding model, vertical roller shutters and standard hinged units. When choosing your shed make sure that the door height and width is big enough for you to move your items and vehicle in and out of. Arrow sheds come with standard hinging doors and lockable door latch. The premium range of vinyl coated storage sheds from Arrow sheds feature deep-track doors on glides for a non-stick, smooth-sliding operation. For customers looking for a durable and affordable option – a metal storage shed is often the answer. 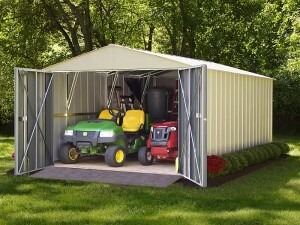 StorageShedsDirect.com is the authorized main dealer for all of the biggest manufacturers and is currently offering FREE ground shipping within the contiguous US. Visit storageshedsdirect.com for more details. This entry was posted in Shed Articles and tagged arrow shed kits, arrow sheds, arrow storage sheds on June 5, 2013 by gorman101. Thank you for an informative blog post. I really like what you said about the sheds design. Its cool for me to think about the different door styles, the different locks and, the different roofs. I just want to make sure that I know enough to make a practical decision about purchasing a shed. Thanks for sharing these tips with your readers. I am sure a number of people are now going to shift their loyalies to metal sheds due to its advantages that were not known. I am certainly one among them. Thanks you once again. Thanks for your comments, feel free to hit “Like” on our Facebook page as well. Appreciated. Please tell me the popular storage sheds providers to keep my old car. We carry Arrow, Duramax and Rhino Garages. It you don’t what to spend too much then a Rhino shelter might do the job. Arrow metal garages a little more expensive or Vinyl more expensive again. Hope that helps. Call our toll free number for more info from our experts. Hi, I guess when it comes to rain noise concerns, metal by nature will make a little more noise that plastic, resin or vinyl. But I wouldn’t lose any sleep over that fact. (Unless you actually plan to sleep in it..!) Vinyl metal still a good shed and good price also over some of the other models.